Read our Fall 2018 Newsletter! For nearly thirty years, the MAA has hosted an annual banquet with only two official purposes in mind: recognize and honor our most recent Outstanding Alumni Award recipient, and award scholarship to deserving graduates. Those are lofty and valuable purposes. Over the years, however, I’ve watched the banquet come to provide something else. Something rich and meaningful. Something surprising and wonderful. With each new scholarship, we bring a family’s story of love and hope, of honor and perseverance, to the community. We share each family’s legacy. As part of the evening, students receive their financial award and the personal story of the scholarship is shared. Some awards, established after a difficult loss, are very emotional. Other awards were created to honor the memory of amazing teachers or cherished parents. They’re celebratory. Whatever the reason, whatever the motivation, each scholarship becomes part of the rich history of our district. Each award is a permanent legacy honoring an individual, family, or class. In 1989, the MAA awarded two scholarships totaling $200. By 1997 we were able to award four scholarships, totaling $6,000, and by 2001 we provided seventeen awards totaling $14,000. Each new scholarship telling another story of someone special. If you were in the audience this past spring, you know that as forty-five scholarships, totaling $76,000 were awarded, you also learned about the people, the businesses and the history of our district. You can’t live forever. Neither can I. But, with a permanently endowed scholarship, you can get a whole lot closer. If you want to come away with a full heart and a better understanding of our community, come to the banquet next April. It’s worth it. If you want to live forever, call me about establishing a scholarship. It’s your legacy of good. We want to stay in touch with all our alumni! It is always wonderful to learn about your latest accomplishments and share them through our Alumni News for all to enjoy! Let us know what you've been up to since you've graduated, or since the last time you contacted us by filling out the form below. You can always update this information in the future to help keep everyone up-to-date on your achievements! ﻿Download﻿ a copy of our most recent newsletter! 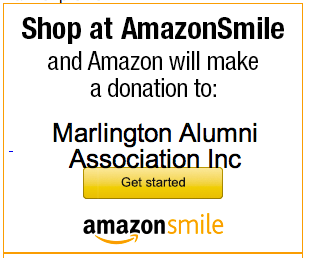 Contact us at marlingtonalumni@yahoo.com for more information. Find us on Facebook!